The days of being forced to deal with a bulbous camera bump to enjoy optical zoom in a smartphone may soon be over, as Apple has invented a new variety of compact telephoto lens system. The patent —rather unimaginatively titled "folded telephoto camera lens system" —describes a method of forming a telephoto lens into a sort of lowercase "r" shape, reminiscent of an old-fashioned periscope. Light is channeled in through the primary lens, bounced off of a mirror, and redirected to the secondary lens which focuses it on the image sensor. Moving the secondary lens up and down, even by tiny increments that may amount to fractions of a millimeter, would achieve the telephoto results. 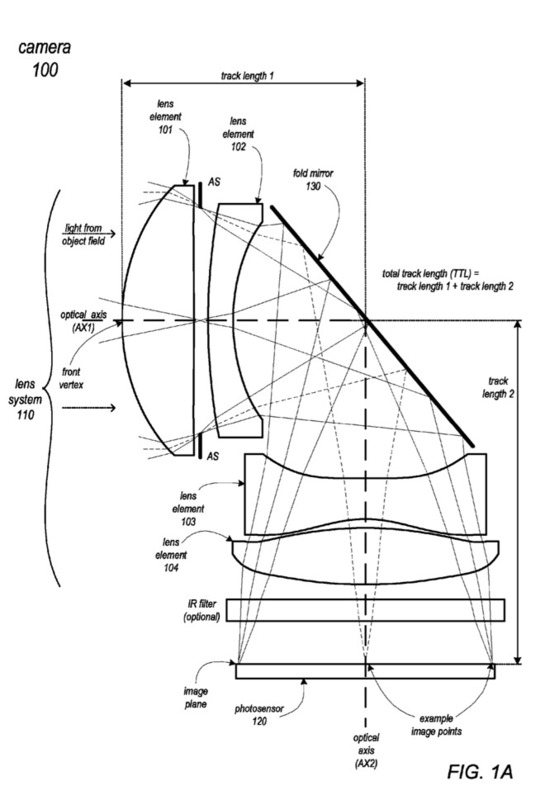 Interestingly, Apple discusses one scenario in which the folding telephoto lens would be included as a secondary option. Users would be free to choose between it and a more standard wider-field lens when taking photos. Rumors that Apple was considering moving future iPhones to a dual-camera setup have persisted for years, but they have really picked up steam with the so-called "iPhone 7." Numerous supply chain reports and even supposedly leaked parts have pointed to such a move, meaning the new telephoto lens system may make its debut sooner than later. Apple credits Romeo I. Mercado with the invention of U.S. Patent No. 9,316,810.